What a great way to show a friend or relative who is feeling under the weather just how much you care! 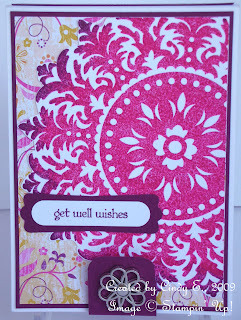 I saw this idea on the Scrap Bitz blog a long time ago and bookmarked it, knowing someday I'd use it. Don't you think this is just the perfect little project for a class, especially since the flu season is coming? I'm having one next month, and already have people signed up for it! The inside has a little travel pack of tissues, some lip balm and a throat lozenge, all held in place by Glue Dots. Too darn cute! This class is scheduled for Oct. 10th at 1:00 p.m. You can sign up by contacting me through my demonstrator website (above right), or leave a comment here! What a cute idea. Wish I was close enough to take the class. Do you have any other details you can send, measurements, etc.